On the 14th of May 1931, just outside the small municipality of Ådalen, Swedish military opened fire with a heavy machine gun on peaceful demonstrators. Four demonstrators and a spectator were shot dead and another five demonstrators were wounded. This article describes what occurred. During the summer of 1930, there was an ongoing conflict at a sulphate factory in Marmaverken. The owners wanted to reduce the pay and when the workers went on strike, strike-breakers (”scabs”) were hired to ensure the production.The owner of the factory, Gérard Versteegh, also owned other factories and plants and the conflict eventually spread to these places as workers went on sympathy strikes in order to support their comrades at the sulphate factory. In the spring of 1931, as the rivers and lakes had cleared-up from the ice, the company sought to start shipping out the stock of paper pulp which had piled up during the winter. As the workers ran a blockade on this as well, the company decided to bring in scabs (the company referred to them as "persons willing to work”) in order to start the loading and shipping. On May 12th (or 13th, sources vary) ca 60 strike-breakers arrived at Ådalen and immediately took up work. This caused tentions to rise almost to the breaking point and on May 13th, around 500 protesters rallied and marched to the pulp stock. When they arrived at the stock and saw the scabs loading a steam ship, they intervened to halt the loading. Most strike-breakers fled at the sight of the demonstrators, but a few tried to hide in the ship's cargo bay, but were hauled up and made to promise that they would return home. As the local police force had been unable to prevent this, and to protect the strike-breakers, the County Governor turned to the Army, asking them for help. On the evening of the 13th, 60 men under the command of captain Nils Mesterton arrived at Ådalen and included both infantry and a mounted troop as well as a machine gun platoon. That evening and during the night, a number of small incidents took place, including throwing stones. The military answered with firing blanks and throwing smoke grenades. On May 14th, the local trade unions held another rally and it was decided that they would again march to the accommodation house. This time, the number of demonstrators were far greater; the local authorities estimated that 3,000-4,000 persons participated, other estimates say as many as 7,000. The idea was to march to the "no trespassing”-limit that the authorities had declared, and then turn back. At this time, the demonstrators had been cited the Insurgency Act, declaring that anyone who did not abide by commands issued by the authorities, would be considered an insurgent and be dealt with accordingly. 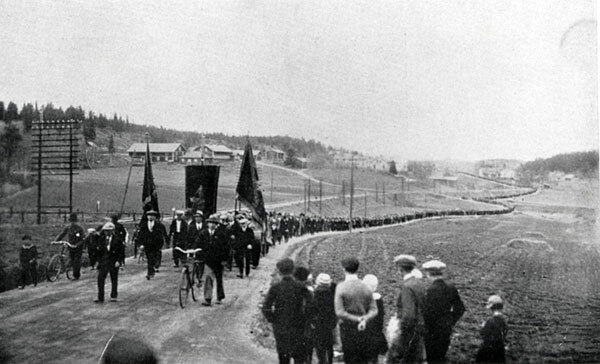 When the protesters reached Lunde, just outside Ådalen, the road had been closed by the military, ordering them to disband and go back. As the demonstrators continued to march, the mounted troop tried to halt them. One of the troops fell off his horse, and then drew his pistol and fired a couple of warning shots. Captain Mesterton now ordered the demonstrators to halt and warned them that unless they complied, he would open fire. The demonstrators kept pushing on and at a distance of less than 100 metres, the machine gun started playing its deadly music and did not stop until a member of the union marching band managed to sound the "cease fire” signal on his trumpet. As the gun smoke cleared, four unarmed workers and a bystander lay dead and another five workers had been wounded. Mesterton would later claim that he had seen weapons amongst the demonstrators, but the investigation that followed determined that none of the workers had been armed. The machine gun fire was not aimed directly at the workers but at a point half way between the gun and the demonstrators. Ricochets hit the demonstrators, thus causing the casualities. As a captain of the infantry, Mesterton must have realised that the ricochets would not just dissapear and so therefore is hard to draw any other conclusion than that Mesterton did not really care about the possible outcome of his plan. This conclusion is supported by the fact that he choose to use the machine gun, a much more powerful weapon, rather than to let the soldiers use their rifles. Mesterton along with a few other soldiers was put on court martial but was acquitted of all charges. He was later promoted to major and then lieutenant colonel. Thanks Steven for posting this. A totally unknown incident for most of us. Moving pictures in several respects. Features footage of SAC secreterary-general John Andersson and once anarchist leader Hinke Bergegren speaking.